Access by public transport: Get off at the “Yugawara Station” of the JR Tokaido Line, from there take a bus for “Fudo-taki Falls”, after get off the bus, walk for 1 minute. Photo taken on Nov. 2011. 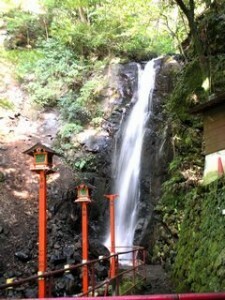 This famous waterfall is one of the five great waterfalls of Yugawara area, it is 15m in height. 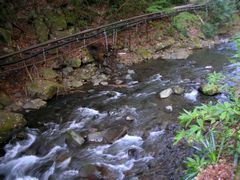 (The five great watefalls of Yugawara are Hakuun-no-taki, Kiyomi-no-taki, Godan-no-taki, Daruma-taki and Fudo-taki) The waterfall was named after the Fudo-Meiou statue at the side of the waterfall. 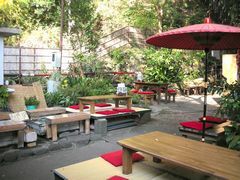 You can enjoy a tea break in at the side of the Fudo-taki waterfall. Have some sweet treats while enjoying a magnificent view of the waterfall must be wonderful. 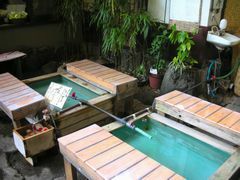 You can also enjoy the foot bath in the store. 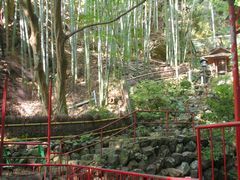 The waterfall is surrounded by beautiful bamboos and trees. 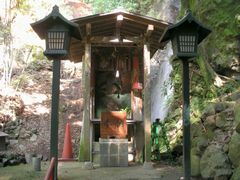 There is a Shusse-Fudo-Son Shrine located at the side of the waterfall, created a mysterious atmosphere. A beautiful mountain stream streams down the whole town and steam of the hot springs rose from everywhere, it is a country of hot spring with extraordinary beautiful scenery.. 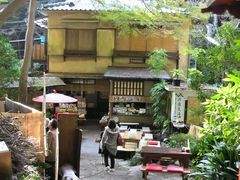 It is located at a 5-minute walk from the Fudo-taki Falls. 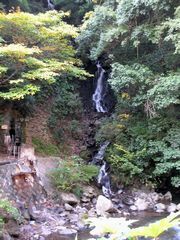 This is another waterfall listed as one of the five great waterfalls of Yugawara, it is 100m in length. The name of the waterfall, Godan (means five steps) was named after its shape looks like there are five steps in the waterfall. The source of the hot spring flows from around the mountain stream and is filled with steam.